PRE-SALE TICKETS ARE NO LONGER AVAILABLE -- TICKETS WILL BE AVAILABLE AT THE DOOR UNTIL WE SELL-OUT!!! THANKS AND WE'LL SEE YOU THERE. IF YOU'D LIKE TO JOIN THE POKER TOURNAMENT, THERE ARE A COUPLE SEATS LEFT - STARTS AT 8PM! Our annual casino night is back for 2010 - twice the size, twice the crowd, twice the prizes, and twice the fun! All proceeds from this year's event benefit Gawad Kalinga - an *amazing* non-profit that has built over 1,000 self-sustaining villages in the Philippines and other countries in Southeast Asia. In addition to all your Vegas favorites, enjoy performances from 3 award winning local musicians - if you're one of the more than 250 who enjoyed it last year, you're sure to LOVE it this year! Our exciting 2nd Annual Shanghai Nights Texas Hold 'Em Poker Tournament is bigger and better! 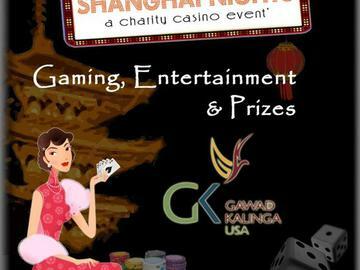 Play for the Shanghai Nights 2010 Poker Championship title and our PRIZE POT! Seating is extremely LIMITED and is expected to SELL OUT quickly. Guarantee your spot at the table by purchasing in advance your Shanghai Nights admission ticket and add the Poker Tournament Buy-In listed above. All levels welcome. Good luck!